SURKHET, April 05 : An aircraft of Buddha Airlines has conducted successful Surkhet-Kathmandu test flight Wenesday . Surkhet is the capital of Karnali province. A 47-seat aircraft with call sign 80 R 42 conducted direct Surkhet-Kathmandu test flight, said Chief of Civil Aviation Authority of Nepal, Surkhet, Binod Kumar Panta. He said, "Although the aircraft conducted successful Surkhet-Kathmandu test flight, it is still to receive its report." Senior officer Bidhya Shah said that the aircraft made the flight at 11:00 am from Surkhet. 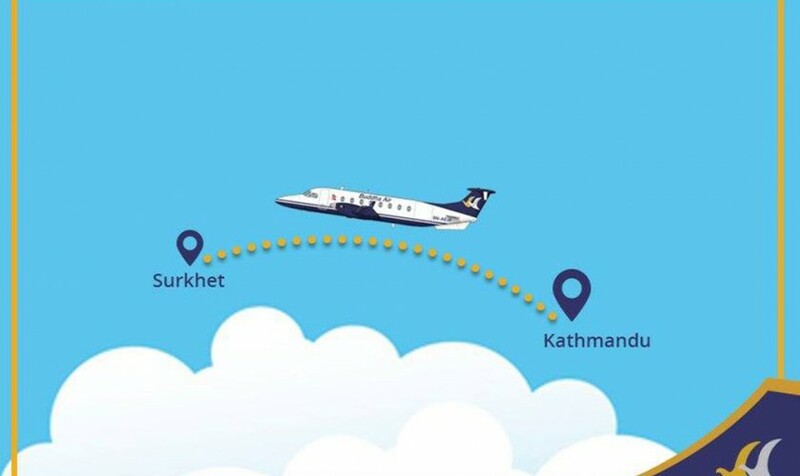 Shah said probably Surkhet-Kathmandu regular flight would begin from April 14. Locals of Karnali province had demanded with provincial government for operation of Surkhet-Kathmandu flight. Keeping the demand of Karnali province folks in mind, Chief Minister Mahendra Bahadur Shahi drew the attention of the federal government for the same as well as held meetings with private airlines companies.